Consider me Pavlov’s dog, and consider Ms. LHA the bell. I’ll salivate over any of her books. She could write a book about species of mold and I’d drool all over it. Chains leaves the heartbreaking teenage world of Speak, Catalyst, or Twisted and returns to the frank historical perspectives of Fever 1793, although this time with a healthy dose of moral consciousness. Isabel is a young slave in Rhode Island, but as of yet, her mistress has been benevolent. In fact, her mistress has promised that Isabel and her younger sister Ruth will be freed upon her death. However, this promise does not come true. Instead, Isabel and Ruth are sold to a married couple, two Loyalists living in New York City, who almost seem to take pleasure in mistreating the two girls. Isabel knows that if she can find the right court documents, she can prove she should be free, but at what cost? And should she get involved with Curzon, a male slave of a Patriot master, selling her master’s secrets for her own freedom? This is a great book to read right now, with politics feeling so darn confusing and polarized. At the dawn of the Revolution, where were the slaves? This book seemed to me the little sister of M.T. Anderson’s The Astonishing Life of Octavian Nothing, every bit as authentic, but without the sinister edge. 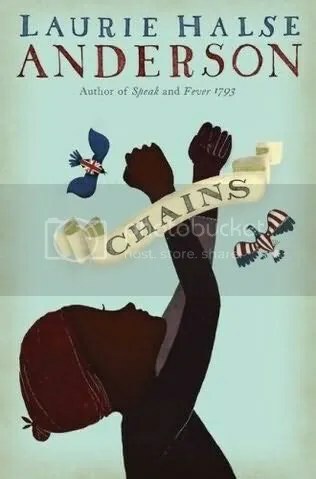 Like the rest of the Halse Anderson oeuvre, Chains is ultimately a girl struggling to make sense of the world and how they can get the most out of it. Highly satisfying read. Buy this for: historical fiction loving middle school girls, historical fiction loving high school boys, historical fiction loving grandpas, aunts, and cousins.